The moment I felt depressed, it never occurred to me to do anything else but be depressed. The progression from a feeling of depression to being a depressed person was a foregone conclusion that I never questioned. Depression always ends. Not because of Prozac. Not because of psychotherapy. Not because of psychoanalysis or shock treatments. Depression always ends because it is in the very nature of depression to end. The only question is, how can we get it to end sooner, the way we want it to, instead of later, which we hate? The answer is that we have to learn to think about depression in a different way. But it is not going to be enough to simply consider new ideas from a safe distance. We have to get down on our hands and knees with a magnifying glass and crawl around inside of the beliefs we have for so long relied on. It is not going to be enough to consider what we think. We have to consider how we think because the problem of depression lies in the very gears of our thinking process. Depression makes us fearful that we will never be truly happy because we see how our happiness can be blown away in an instant, like straws in a hurricane, and absolutely nothing remains to comfort us in our anguish. We need not be afraid. We do not need comfort. It is not true that all our happiness has fled and what we are suffering is the pain of its loss. Our essential capacity for happiness is not something we can "get back" or acquire no matter how hard we try because it is our natural state. What happens is that depression covers over our natural state and tricks us into thinking that we don't have it anymore. When we properly address our depression, it relinquishes its hold upon us, and we find ourselves once again in the bedrock of our infinite okayness. Practically speaking, happiness is unlearned depression. Our essential happiness is not conditional. Conditional happiness can not pass for essential happiness anymore than being serially grateful for disparate things can pass for a state of infinite and abiding gratitude. Conditional gratitude, where we see something that causes us to be grateful, is not the same as essential gratitude, where being grateful causes us to see something. Conditional happiness, the temporary excitement of having what we want, is not the same thing as essential happiness, the transcendent awareness that we can want what we have. Conditional happiness is a feeling that comes and goes. Essential happiness is our original state of well-being that is always available to us. It is not quantitative despite the fact that we think it depends upon some quantity of things or feelings we "must have." Depression is not quantitative either despite the fact that psychiatrists have labeled it a disease and divided it up into various classifications and diagnoses. Depression, like essential happiness, is qualitative. But depression is not our natural state, it is a state of alarm. When I began my career as a psychotherapist in 1987, I was as deeply afflicted with depression as anybody else who walked through my door looking for help. But no more. I have come to see depression in a revolutionary way that has totally eliminated the whole idea of it as a disease in my life. After suffering with it for decades; after watching my brother struggle with the same ravages of manic depression that killed my father, I know, now, that it doesn't have to be that way. There are 17 million people suffering with depression who are all seeking an answer to their hurt and pain. Ten years ago, as a result of my work as a cognitive behavioral therapist, my struggles with my own severe mood swings and my experiences with patients who came in for therapy, I discovered the real cause of depression. I haven't "been depressed" since that time. This book is not an orthodox book on depression. The trouble with orthodox books is that we agree with them. We seldom do things we agree with because agreement makes us feel so comfortable that it is easy to substitute our knowledge for our action. There is simply no movement without resistance, as physics tells us. That's why we bounce a ball on the hard floor instead of a pillow. That's why we do exercises. Because we seldom agree with them. Exercises make us feel so uncomfortable that we end up doing them out of some kind of spite, and they take us galaxies beyond anything we intellectually agree with. There's a good chance you won't agree with even the title of this book. You may find it uncomfortable, annoying, confronting, outrageous, even dangerous. 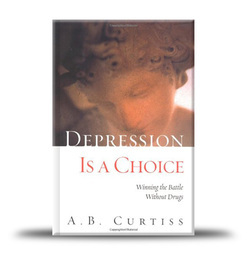 How can depression be a choice? You may want to argue with this book, fight with it, wrestle it to the ground. Good. The quickest path to change is through our resistance to change. And there is nothing we less want to change than our own long-held opinions, and the process of how we think. It is human nature. But sometimes the very act of defending some deeply-held idea causes us to look at it more closely. We see a flaw. I have sat down at my desk in a furious rage to write down all the one, two, three points that "prove I am in the right;" only to find, as I read over my own words, the surprising clue to my culpability. The other problem with orthodox theories about depression, in addition to the fact that we agree with them, is that at some point they all depend upon some faulty but hidden premise that no one thinks to ferret out because everyone is so caught up in the admiration of the excellent logic employed. We are all subject to this touch of intellectual arrogance. The hidden premise in psychiatry and psychology, upon which both disciplines depend entirely, and without which all of their diagnoses and treatments would disappear in a puff of smoke, is that the persona and the self ( the mind and the self) are one and the same. This is based upon Freud's model of the unconscious mind that has never been scientifically proven but has always been taken as a "given." "Ultimately our troubles are due to dogma and deduction," warns historian Will Durant. "We find no new truth because we take some venerable but questionable proposition as the indubitable starting point, and never think of putting this assumption itself to a test of observation or experiment." So I do not depend upon my logic as proof that I am right. I am sure my ideas work because I have already freed myself from depression, and I have lived in a calm state of cheerful sanity for more than ten years. My logic does not proceed from a disease in search of a possible answer. My theory starts with the answer I have already found and goes backwards to see how I did it. You may, at this very moment, be suffering from depression yourself, or someone you love may be fighting their own terrible battle with it. What I say in this book does not come from the abstract notions of some lofty and idealized therapist's pulpit. It comes from my soul's-depth experience of the very pain you may now be suffering. It is a pain that I think I can help you negotiate because I have learned how to negotiate my own pain. Sometimes you may not so easily follow my thinking, but my intention in the pages ahead is to be your true companion, trying to make myself understood not by telling you how you must have been doing something wrong to be feeling so bad, or to list all the ABC's of what you should be doing and thinking. We get depressed not because we are doing something wrong but because there are a few essential things we have never been taught how to do at all. Thanks to some new advances in neuroscience that have pointed out the way, we can all learn how to do these things. In the coming chapters I will illustrate for you the progress of my own education and how it has served me, my own errors of thinking and what I have done to correct them. I will pass on to you precepts rooted in ancient wisdom as well as some rather esoteric philosophical concepts that I have found helpful. I will also tell you stories about incidents in my own life, and then link all of these up with current scientific research. I now have the tools I need to handle depression. But they are not tools you can so easily hand over, ready-made, to someone else. They are tools that only emerge into being by entertaining small ideas and applying them to your life. Depression is essentially a trick of the mind. First, we can learn how this trick works so that we will not be fooled by it so easily. Then, we can develop our own tricks to protect us from this life-disturbing strategy of the mind-gone-wrong. The solution to depression lies waiting on almost every page of this book. One person will click with an idea in the first chapter and think, "I get it." Someone else will read to the very last chapter before something will spring to life for them. Another may read the book, put it back on the shelf and later a situation will occur and they will connect it with something they have remembered and, click, click, click. They will get it. The secret to depression is very much like the secret of learning how to read. And isn't it simple and easy when we know how? And isn't it seemingly impossible for those who remain illiterate? And how many of us could have learned how to read on our own, without anybody teaching us? And who has ever tried to teach us about depression? For those of us who experience it depression is like living your own death. As successful as I was in many other aspects of my life, I was often paralyzed by a chronic despair. I spent half my life locked in a joyless, painful, coffin-of-the-mind. I learned about depression from the inside of it, from the pain, from the helplessness, and from the hopelessness. One day, when depression began its periodic and pitiless attack upon me, I decided to fight back, mentally, and found that I had the power all along to escape from depression, I just didn't know it. I discovered that I had a choice. I did not have to meekly give way to my painful feelings. I could battle them for precedence and win! If the three most important things in real estate are location, location and location; then the three most important things in mental health are perception, perception and perception. It is our perception of depression that is the problem more than the low level of serotonin that seems to cause all the trouble. When we are born, our perceptions are very limited. We have not even differentiated our own self from the world that surrounds us. As newborn infants we must learn to distinguish our own legs from the ceiling! We all transcend this first enmeshment when we learn to distinguish our body from the universe at large, as well as from other bodies. For many of us, this is as separated as we get. Our soul remains merged with the self, and our self remains merged with the mind. I cannot yet see through that "one-way mirror" of the soul that enlightened ones such as Buddha describe. I keep company with that larger part of humanity; those of us who, like moons in a cosmic midnight, know not the sun to which we owe our luminous existence. But I have transcended my enmeshment with my mind enough to be able to free myself from depression as an act of will. Please note that I say "free myself from" depression. Yes, the feeling of depression is caused by a chemical imbalance in the brain, but "disease" or "medical illness" is not the name of the situation. Depression is not a mental illness. It is not even a cultural illness, though that might be closer to the mark. Depression is a mind set. We don't need to cure the mind. We need to cure the set. It is neither necessary nor possible to "cure" the primal impulses of depression or mania, which are merely extensions of the fight-or-flight response--our most basic defense mechanism. What we need to cure is our reaction to them. Most people think we can't do that. Most people think that what creates our perceptions and the behavior of depression and manic depression lies within the workings of our "unconscious mind" and is therefore not accessible to will. I found this to be incorrect. We simply have to learn how to use our mind, instead of thinking we are our mind. This is the meaning of that old maxim: The mind makes a wonderful servant but a terrible master. With a push from the New Age spiritual movement, we now understand the body-mind connection; that the mind can have a powerful effect over illness and healing in ways we once didn't think were possible. But we have not yet grasped the mind-self connection; that the self is supposed to direct the mind to manage our health, thinking, feelings and behavior. The mind-self connection is the key to depression. If the self does not choose to direct the mind, the mind may bury the self in all sorts of varieties of negative thinking and mood disorders. In the absence of any conscious direction by the self, the mind can direct itself right into mental illness. Goethe was clearly referring to this same idea when he wrote, "Where a man has a passion for meditation without the capacity for thinking, a particular idea fixes itself fast, and soon creates a mental disease." Yes, depression is strong and painful, and we can get very focused on it when we get into that downward spiral. But we don't have to. We can cure our easy habitual reaction to depression, which is to succumb to it, and as an act of will regain our lost equanimity. That is because we can improve the mind. We don't improve the self. Rather, we more or less uncover the self or don't uncover the self, use the self or don't use it. Human beings don't just know something, we also know that we know it. What we know (mind) may change as to improvement, but the awareness that we know (self) is not a matter of improvement or gradation, it is a matter of "either/or;" it is a matter of "asleep to it or awake to it." This means that the understanding that we are painfully depressed can awaken us to the hidden point of choice; it need not abandon us at the edge of despair. Where is choice hidden? Choice is hidden between the awareness of the self and the use of the mind. Choice lies eternally and changelessly between the "I am" and whatever else may follow it to complete any sentence (such as "I am" depressed). In order to exercise this choice we must learn to split the atom psychologically. That is, we must be able to separate out the "I am" from the "I am angry" or the "I am" from the "I am depressed" so that we can understand we are not those things; and in fact, we are much more powerful than depression or anger. It is simply a matter of educating and training our minds so that anger and depression are no longer in charge of us. We are in charge of them. For many of us depression is the fight of our lives. We can win that fight. We can do whatever we have to do to win. We can read anything that can help us. If we don't understand it at first, we can study it. We can encourage ourselves into a belief that we can get better which is just a little bit stronger than our belief that we can't. All that we need to begin is our earnest desire to understand. It is the strongest force in world because understanding is not just a possibility, it is our destiny. I may still struggle with the chemically-based impulse to depression. But I no longer "get depressed." I may still be momentarily overtaken by depression, but I can no longer be taken over by it. My struggle with depression is different now, and on a more conscious level. The battle is not limited to the lower brain states of emotional pain and my reactive behavior to that pain, for I have learned to call upon the higher brain functions of reasoning, intelligence, and creativity that now come to my aid. I have game rules, boundary lines, and acquired skills for play, such as there must be in any endeavor where we find our creature selves pitted against nature for survival. The end result is that I have domesticated "the Beast" which I had once thought must forever feed upon me at will. And like an old sea-captain whose experiences have toughened him into a worthy adversary of the mighty ocean he sails, at times, and from a respectful distance, I, too, regard my own unfathomable "deep" with an awe not unmixed with affection. Depression, well encountered, has many virtues. But depression no longer has the authority to intrude itself upon my daily life. I am not claiming, however, that I control depression. This would be a foolish attempt, like trying to control electricity, or the ocean, or nature. We do not seek to control these great imponderables. We do not dare to grab them by the throat and throttle them until they do what we want. We observe them, and respectfully learn their principles so that we can have a safe and proper relationship to them, and make good use of what they have to offer us. By studying depression in this manner, I have learned to control my response to it based upon my understanding of its principles, and the discovery and exercise of what precautions I must take in order to "command" it. There is no other way. Cutting, shocking, or drugging depression out of our brain is like wrestling with lightning; we will only harm ourselves. The right way is not to gain complete control over depression but rather to gain complete control over our reaction to depression. It is a very simple solution. Unfortunately, in the beginning, for those of us who have a habit of going deep into depression, it is also very difficult to do. It was the difficulty of managing their terrible pain of depression that most often brought people into my counseling office in search of some common-sense therapy for a failed relationship with their spouse, or their boss, or their child. Slowly I began to sense a pattern in the unconstructive, almost passive, way in which we were all living our lives. It seemed to me that my problem, and everybody else's, lay in the lack of clarity and directedness in our everyday thinking, especially when depression hit. We all had an extreme dependence on a very vague reality, thinking things and doing things in a certain way, not based upon any clear, conscious investigation or choice, but simply because we have always thought it or done it that way. For instance, if I were at a party and a feeling of depression came over me, I always excused myself as soon as possible, went home, and crawled into bed. The moment I felt depressed, it never occurred to me to do anything else but be depressed. The progression from a feeling of depression to being a depressed person was a foregone conclusion that I never questioned. But a dedicated long-term, systematic study of my habits, especially those habits that I employed automatically whenever I got depressed, opened my eyes to some entirely new possibilities. The first thing I discovered was that I had never clearly understood that sleeping in my clothes, staying in bed for days, sighing a lot, and talking in a weak, sad voice were habits, choices. I thought they were reality, my life, the behavioral necessities that came automatically with the paralyzing pain of depression. The psychiatrist I went to as a young woman in my thirties also believed that. He suggested drugs. But drugs had not greatly helped my brother or my father with their manic depression, so I refused drugs, hoping something better would come along. I was not to find that "something better" for fifteen years, not until after I became a psychotherapist myself. I would like to say I had a brilliant theory that transformed my life. But it was not like that at all. Looking back I can pretty much piece everything together, how one thing led to another and how, therefore, it all came about. But it wasn't so much a matter of creating fundamental ideas. It was more like fundamental ideas kept coming and dragging me along by the scruff of the neck. And when I still didn't "get it," since there is nothing more patient than potentiality, they would come around in another disguise so I could "discover" them all over again in a different and hopefully more promising context. Sometimes I was not a quick student, but anyone who ever knew me could see that I was tooth-and-claw tenacious. It may seem that I was always quick because I relate to you, in the coming chapters, incidents of "instant" success. But I know that any such instant was the shining victory to a great siege of unknowingness that went before, much of it so unknowing that it would be difficult for me to reconstruct it. There will always be connections between my breakthroughs and my awareness of unknowingness, but they are not always easy to catch. Most breakthroughs are not so much a case of truth being revealed as ignorance being dissolved. This is a level of experience about which one can say nothing, and yet something of meaning has nevertheless being conveyed. Perhaps it has been a help to me, as well as a scourge, that even as a child I was often introspective. When I was ten I had an experience that started out as a kind of playacting that all children turn to when they are bored and lonely, but it transformed into something much more significant than that; a deep awareness that I was alone in my ultimate responsibility for myself. Even though I denied it for years as an adult, I was always being pulled back to this essential core. I can remember staring dreamily and intently at myself in the full length mirror on the back of the bathroom door, a little girl in white cotton underpants, hair still damp from a summer bath. I realized that I could not really see myself in the mirror all at once, the way I could see other people when I looked at them. I could see any one of my features clearly but I somehow couldn't focus on my complete image in the mirror or carry it in my mind like I could carry the complete images of other people. I could recognize myself when I looked at the mirror, but when I turned away I could not reconstruct myself in my mind. This did not frighten me, but it started me thinking some rather odd thoughts. I found that my image would disappear when I stared intently into my own eyes for a long time. At a certain point, only the staring would be left to stare back at itself. Then I began trying to see through the eyes in the mirror that were looking back at myself so I wouldn't disappear, and this is what I thought: I am going to remember this exact moment forever. I am going to remember always that I am now ten years old. I am always going to remember myself. I am going to grow up and, when I do, I am going to remember this time and come back and keep myself company so I won't be so lonely. For some reason this thought was a great comfort to me, beginning at that exact instant, and continuing for all of my life. I might forget it for years at a time and then it would come back to me. There was something very important and solid and real about this thought. Even today it gives me a sense of being ageless and timeless. When I lost this sense of core self in the busyness of growing up and mixing-it-up with life, I found two remarkable teachers to help me salvage my ship of self-responsibility when it foundered. Osho was an Indian guru who is now widely published. Dr. Allan Anderson was the sage I encountered in graduate school at San Diego State University. And I must credit all those books that jumped off the shelf as I rummaged through old book stores or foraged through garage sales. I first sensed Dr. Anderson was no ordinary teacher when I found that two students in one of his courses were quantum physicists who had driven from Los Angeles to San Diego three days a week for ten years to audit his classes! Sometimes the physicists were able to illustrate some small point for the class such as the "myth of continuity" with descriptions of their experiments on quarks. And here is one book incident: Just before I entered graduate school we moved to a new house from the rented quarters we had been in since our big move from New Jersey to California in 1983. I got lost trying to meet with a real estate agent and found myself at a small psychic community book sale where I proceeded to buy the whole lot, whatever wasn't a Harlequin romance or a Louis L'Amour western. I took a chance on everything else, even Greek history, feathery handwritten journals of "sidereal theory" (whatever the heck that is, I thought), Chang Tsu, Sankaracharya, and Karl Menninger. The paperbacks were only 25 cents each, and I had been supplying myself with what often turned out to be disappointing paperbacks from the drugstore at four or five dollars per to feed my long-term reading habit during the year and a half my own books were in storage. You can well imagine the metaphysical treasure trove I thus came by. The lot included some volumes on The Metaphysical System of Hobbes, a various assortment of Yogananda, Krishnamurti, Rudolf Steiner, L. Ron Hubbard, Edgar Cayce, Mary Baker Eddy, Martin Heidegger, and George Gurdjieff. For one dollar per hardback I grabbed up an odd accumulation of Carl Jung, Max Picard, Erich Fromm, R. D. Laing, Alfred Adler, Lugwig Wittgenstein, and Alan Watts. There were a couple of anthropology and astrology text books. There were also some wonderful old 1890s to 1930s books on hypnotism, astronomy and "scientific studies" of Mind, not the human mind per se but what the various authors referred to as the "cosmic Mind "of which the human mind was "but the reflection." The books on hypnosis were especially interesting to me. One little gem called The Practice of Autosuggestion was dedicated "to all in conflict with their own imperfections." I loved that! Another, Hypnotism: Laws and Phenomena acknowledged Agassiz who said, "Every great scientific truth goes through three stages: First, people say it conflicts with the Bible. Next, they say it has been discovered before. Lastly, they say they have always believed it." In graduate school I took the courses required for my Master's degree in the departments of Psychology and Counseling Education that were quite politically correct for the liberal-minded 1980s, with the emphasis on multiversity, personal freedom, self-actualization and the various Freud-derivative psychotherapies. At the same time I also indulged myself in courses from the more traditional Department of Humanities that expanded my interest in classical literature and philosophy. It was here that I was introduced to Tarot, The I Ching, Tao Te Ching; and the writings of Nisargadatta Maharaj, Heraclitus and Meister Eckhart. My continuing interest in hypnosis led me to study the latest research in neuroscience and brain mapping. There have been remarkable advances in just the last few years in the knowledge of the architecture of the brain by neuroscientists such as V. S. Ramachandran and Antonio Damasio, knowledge that was not available to Freud and William James at the time these respective fathers of psychoanalysis and psychology formulated their theories. My growing familiarity with neuroscience, hypnosis and the more esoteric philosophies slowly began to color some of my attitudes about psychiatry, psychology and the practice of psychotherapy. I began to see that the stronger a therapy emphasized feelings, self-esteem and self-confidence, the more dependent the therapist was upon his providing for the patient ongoing unconditional positive regard. The more self-esteem was the end, the more the means, in the form of the patient's efforts, had to appear blameless in the face of failure. In this paradigm, accuracy and comparison must continually be sacrificed to acceptance and compassion; which often results in the escalation of bizarre behavior and bizarre diagnoses. The bizarre behavior results from us taking credit for everything that is positive and assigning blame elsewhere for anything negative. Because of this skewed positive-feedback loop between our judged actions and our beliefs, we systematically become more and more adapted to ourselves, our feelings and our inaccurate solitary thinking; and less and less adapted to the environment that we share with our fellows. The resultant behavior, such as crying, depression, displays of temper, high-risk business or romantic ventures, or abandonment of personal responsibilities, that seem either compulsory, necessary or intelligent to us, will begin to appear more and more irrational to others. The problem with the escalation of these kinds of diagnoses is that either we can become so adapted to our thinking and feelings instead of our environment that we will become dissociated from the whole idea that we have a problem at all; or at the least, the more we become blameless, the more we become helpless in the face of our problems, thinking our problems need to be "fixed" by outside help before we can move forward on our own. For 2,000 years of Western culture our problems existed in the human power struggle constantly being waged between our principles and our primal impulses. In the last 50 years we have un-principled ourselves and become what I call "psychologized." Now the power struggle is between the "expert" and the "disorder." Since the rise of psychiatry and psychology as the moral compass, we don't talk about moral imperatives anymore, we talk about coping mechanisms. We are not living our lives by principles so much as we are living our lives by mental health diagnoses. This is not working because it very subtly undermines our solid sense of self. Uncorrupted unconditional positive regard is powerful; it is called love. However, in order to gain their power of authority as an agent of change, the psychotherapist and the psychiatrist must first pay unwitting homage to the "Great Dread Disorder." If the disorder is not more powerful than the patient, there is no need for a psychiatrist to cure it. So the disorder is what really gets the regard, not us. The unconditional positive regard for the patient is necessarily shallow because this hidden loyalty to the disorder relegates the patient to second class in power and importance not only to the psychiatrist but to the patient's own anguish. Our whole society is now in a state of learned helplessness that psychology has taught us. In contrast to the undue reverence for mental illness as a prime determinant of behavior, that I found in the psychological sciences, was a denial of dignity and authority to disease that I found in the work of Emil Coue in the 1890s. Coue was a French pharmacist who introduced a psychotherapy based upon hypnosis, which in those days was called "suggestion." Coue "tactfully teased some of his patients, giving them an idea that their ailment was absurd, and a little unworthy; that to be ill was a quaint but reprehensible weakness that they should quickly get rid of." Here was the idea that it was our ignorance and weakness causing our problems, not some overwhelming, powerful outside force. The solution was that we were to become informed and strong. And the implication was that it was doable. It was thinkers like Coue who seemed to point solidly in the same direction I had tentatively begun to travel in my determined effort to "cure" my depression. I did, at first, hope to cure depression, thinking it was an affliction. Later, I saw the goal more clearly as coming to a "right relationship" with my depression. What proved correct was my initial decision that heroic effort and self-responsibility was the proper way to head. Perhaps I chose this way because I had already begun to give up on my existing idea of happiness as being either not achievable or a bad bargain, I wasn't sure which. I was encouraged to this understanding about "happiness" by the ancient mystics who warn us to beware of "all desire," of wanting something else other than reality; of wanting something else other than "what is." I found I was now willing to commit myself to that old Victorian adage "Be good, my child, and let who will be clever" by changing it ever so slightly: "Be good, my child, and let who will be happy." When we are able to question our frantic search for our skewed idea of happiness, we turn away from the complications of wanting something other than what we have now got; and then there is only the one and simple path ahead. On this path I encountered Ovid who claimed, "The most potent thing in life is habit;" and Wellington who maintained, "Habit is ten times nature;" and Dryden who warned, "First we make our habits, then our habits make us." My subsequent experience coincided with these philosophers rather than contemporary psychologists and psychiatrists. I found that the positive habits that I formed consciously as an act of will could override the bad habits that I had formed autonomically as coping mechanisms. And though it was the foundation on which I developed the counseling techniques I was now using to help others, I found I needed something beyond traditional cognitive behavioral therapy in order to help myself. So when I worried that my life was becoming so complicated I couldn't see where to begin to make changes, I consulted The I Ching that counseled: "If you wish to be rid of something, it is sufficient to simply withdraw from it in your heart." I began to explore pertinent relationships, relative to depression, among the disciplines of anthropology, sociology, psychology, hypnosis, neuroscience, philosophy and ancient wisdom. I was drawn especially to a salient connection between psychology, neuroscience and moral principle. The insights that came from making this connection so transformed my perception of reality that when I applied this new thinking to my life, I was able to cure myself of 30 years worth of manic depression. Not immediately of course, but over a period of two or three years. Supported by the linking principles of all these disciplines, the now more open-eyed observations of my own behavior, and subsequent theory and practice, a new way of managing depression began to take shape. I started calling my ongoing developmental process "Directed Thinking" when it was so aptly nicknamed by one of my patients. Although Directed Thinking can be learned, it is not a system easily encapsulated, like a twelve-step program. It is a description of my own personal quest to a cure, and the insights that led me, indirectly, to a different relationship with my mind. I do not know how to give you the truth about depression, but I can describe for you exactly the journey I took where the truth about depression found me. It is not necessarily a journey from point A to point B because many important insights were the hindsights of experience before they became the foresights of theory. Thus my journey was sometimes from point G to point B, so it lacks the linear continuity that is generally the stuff of a learn-step-one-then-go-on-to-step-two-self-help text. But this is good. We don't learn psychological lessons deductively, in a linear way. They generally sneak in the back door when we're least expecting them. I love this story about accidental learning that Susan F. told me. She was an elementary school music teacher who was demonstrating for her first grade class the notes of the scale by letting them tap on glasses filled to different levels with different colored water. She ran out of colors and mixed the blue and red to differentiate the last glass. At the end of the class, when she asked the children what they had learned about music, one child raised his hand and said, "l learned that red and blue makes purple." Though Directed Thinking is basically an inductive process, there is still the temptation to impose standards of deductive reasoning in the reporting of it, which can result in a "foolish consistency;" that old "hobgoblin of little minds," about which Emerson warned us. For instance, I might say at one time that pain may not be as real as it seems and another time that pain may be our most trenchant reality, two inconsistent ideas when compared to one another. But these two ideas are less truths to be disputed than they are different-colored lenses through which to see ourselves. In the same sense I may refer to happiness as our original givenness, or a will-o-the-wisp that is dangerous to pursue. An Eastern guru would say it this way: If you want to see the moon, do not debate directions with the finger pointing to the moon, simply look where the finger is pointing. We want the truth about depression. The problem is that the horizon of any truth may be seen differently from a north or a south view. Truth itself may not be "one way" but we can only apprehend truth one way, from one direction, from where we stand at the moment. Anais Nin said, "We don't see things as they are, we see them as we are." The old sages understood this. The reason their sayings often seem meaningless is due to their penchant for answering the questioner instead of his question. Instead of directly answering our question, real wisdom indirectly gets us to change our stand and then we see that it was our question that had been meaningless. In the pages to come I present to you the kaleidoscope of my own journey. At any point some idea may become so clear to you that it could totally change your stand, the way you look at things. This is what happened to me. I was given an "answer" to depression that lies beyond any medical cure for it. As a result of this new understanding, although I still experience the same wide mood swings that used to devastate me, I now remain a calm, stable, sober and cheerful person.